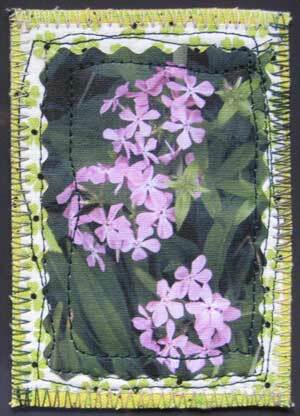 It may be that April showers bring May flowers, but in this case, the flowers came on Artist Trading Cards (ATCs). "If I were a flower" was the theme of the April ATC swap. It was delightful to see what germinated in the traders' minds this month. From personal gardens to Monet's garden and the lotus pond, the trading cards bloomed with floral varieties of all kinds. I am always intrigued and pleased with what I receive in the ATC swaps. 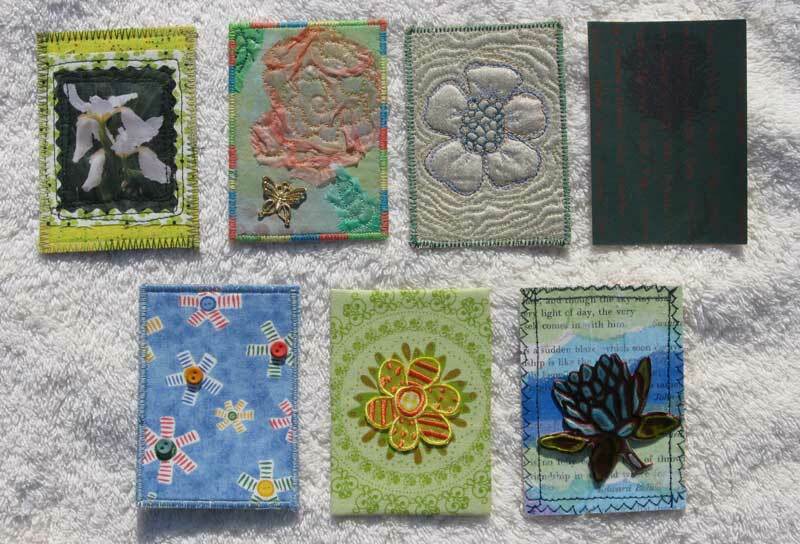 Even though the materials used by the artists are the same—fabric, thread, paper, glue—the results are cleverly and creatively different. Burpee would pay big bucks to feature these flowers in their catalog. "My petals won't fall, nor get stung by a bee. So if I were a flower, consider this me." —Liz A.